Flower delivery services are, by far, your best option of buying that special something for that very special occasion. On your first run, the service might seem a bit tricky to use, but we are going to show you what to look for when you want to place a flower order. This article will cover same-day flower delivery services, international support and our choice in best delivery services. Flower Delivery – why should I use it? Sometimes you might not have the luxury of running around the flower market or seeking flower shops to buy your present. Even though time is not on your side, you still refuse to purchase your flower bouquet from the nearest gas station. So, the most sensible solution out there is to check out some online flower delivery services. Of course, Google searching “flower delivery services” return quite a lot of results, forcing you to do a bit of research before placing the order. Why should you use such a service? Because it saves time and, at the same time, the service guarantee that your flowers will stay fresh. What should you look for when ordering? While most flower delivery websites offer a wide variety of services ranging from flower bouquets suiting for a birthday to funeral plants, you should not lose track of your schedule. Some floral arrangements might take a bit longer to craft than others, leaving the idea of same-day delivery out of the question. Another good tip is to check out more than one website. Don’t jump the wagon and buy the bouquet from the first site, because you might find the same thing on another site but at a better price. Also, be sure to read the site’s disclaimer to make sure that it can deliver to your area. Some flower delivery websites feature international delivery services, which you can use to provide your choice in floral arrangements to someone living outside the country. Look for ways to customize your flower bouquet. Some flower delivery websites will allow you to customize your bouquet. For example, if you like a floral arrangement, but you feel that it’s missing something, you can always add your choice of flowers for an extra fee. Furthermore, be sure to check out the customer review page, to see whether the service suits your needs. Look for stuff like delivery times, freshness and extra charges. If the delivery service has a bad score, it will be a good idea to resume your search. The name of the website might be a bit cheesy, but they manage to make amends through their rich offer. Whether you’re looking for the right bouquet for Mother’s Day or a little floral arrangement for your best friend’s birthday, fromyouflowers.com has it all. Ordering floral arrangements from the website is very easy. Create an account, fill in your delivery details and start shopping. Overall, the website is pretty intuitive and user-oriented. Upon opening the page, you will see the discount section and all services offered by the distributor. Besides your flower bouquet, you can choose to send personalized cards and can also create your very own vase. If the discount and best-selling section don’t suit your needs, then you can navigate through the other sections using the toolbar. You can choose flower arrangements for birthdays, weddings, funerals and other special occasions. The website even includes a price filter which can help you choose the perfect flower bouquet even if you’re on a tight budget. One other thing that makes this website our first choice: the “track your order” function. From the moment you place your order until it is delivered to your front door, this feature shows you the status of your order. The website also offers same-day delivery services, although the offer is somewhat limited. Unfortunately, the site does not deliver outside the country. Fromyouflowers.com will only deliver in California, Texas, and New York. Whether you’re looking for a perfect flower bouquet, or something out of the ordinary like a basket filled with chocolate, then proflowers.com is your answers. Like fromyouflowers.com, Pro Flowers offers a wide variety of services. When you open the site, the first thing you will see is the discount page. Most of the deals are decent, and as a plus, when ordering your flower arrangement from the first page, you also get to choose a vase. Most of the bouquet have four of five vases to choose from, so take your time in order to select the one that seems more appealing. 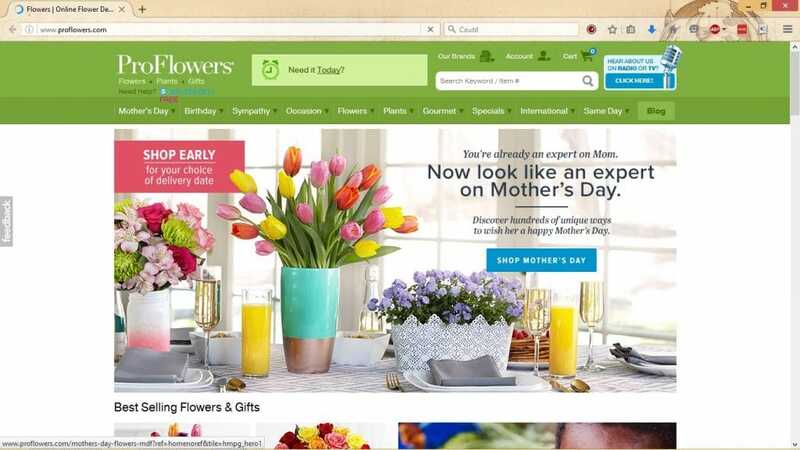 Like the other site we’ve mentioned above, ProFlowers is organized into categories, ranging from Mother’s Day to indoor plants. But, the website has an added feature called the Gourmet section, where the customer can buy special chocolate treats to go along with the bouquet. The site also features a same-day delivery feature, but it doesn’t have a “track order” section. To order something from them, you will have to create and account and fill in your delivery address. ProFlowers.com has an international flower delivery function, which customers can use to deliver their order outside the country. Apart from homeland support, users will now be able to delivery flower anywhere in Europe, Asia, and Australia. According to user reviews, the service was used to send flowers in London, Germany, Japan, Italy, and Canada. This online flower delivery service works with both flower arrangements and gifts. 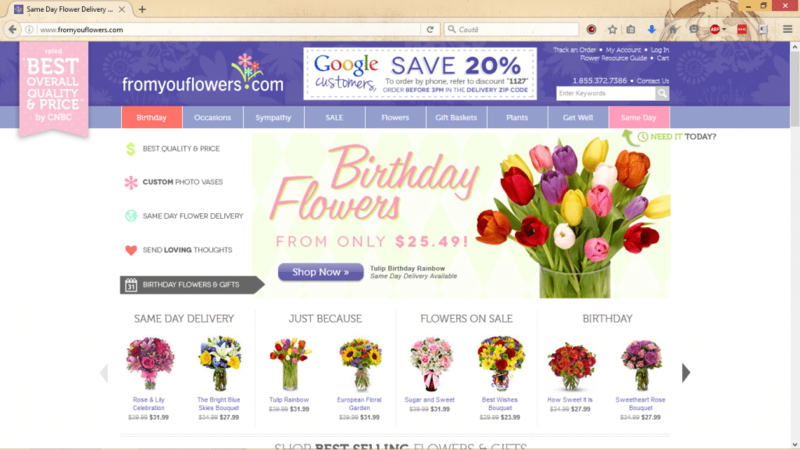 Like the other websites, 1-800 Flowers lets the customer navigate through the site using the categories toolbar. It has quite a lot of discounts and even unique gifts for those who think that flowers are just too dull. One of the perks of buying your flowers from this website is that it offers a discount based on your age group. For example, veterans and children ordering flowers for Mother’s Day will receive a 15 percent discount. 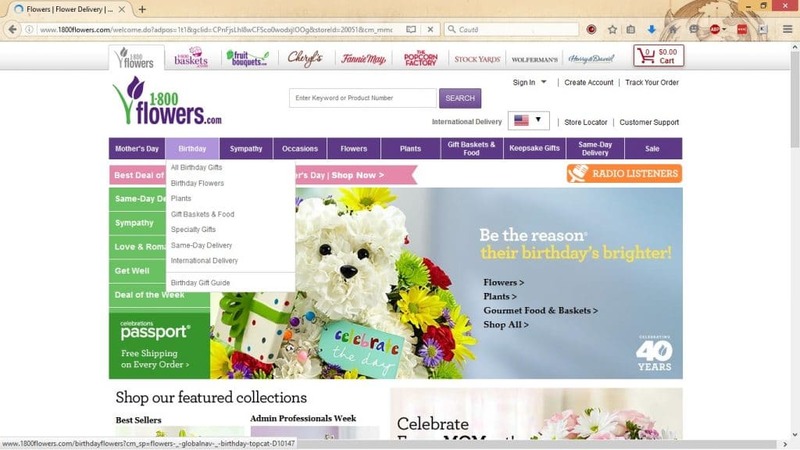 1-800 Flowers has a same-day delivery system, and it also allows the customer to track his order. There are two ways you can receive your order from the website: you can choose to receive your order from a florist the next day, or if you want to receive them at a later time, the package can be sent either through the mail or a courier. The website’s delivery branch works with UPS and with FedEx. These are the most popular flower delivery services available out there. Just keep these tips in mind when placing your order and you won’t have any trouble buying the perfect gift for the perfect occasion. Hey Buddy!, I found this information for you: "Flower Delivery – What to Look For". Here is the website link: https://all2door.com/flower-delivery-look/. Thank you.